I realize that I never recapped my commitment to a meatless December, and this post with recipes for the well loved, often vegan, chips and guac seems like just the place to do so. 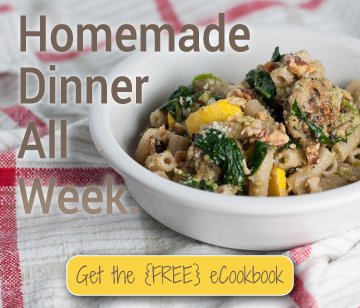 To skip right to the recipe, click here instead. In terms of sticking to my commitment, meatless month was a success. Toward the end of the month, my sister and I went to finalize selections for her wedding dinner at Porter Creek, which specializes in meat. The rotisserie chickens rotating on a spit just beyond the entryway are a pretty good indication. I decided on the car ride over that I would try a single buffalo walleye finger, but I don’t consider this a failure. No, I’m not one of those people who thinks fish is vegetarian. I am, however, an often legalistic perfectionist, and my nature is to approach such a challenge as this with an all-or-nothing attitude, chalking the whole thing up to a failed month for those three bites of fish, and possibly letting it lead to a slippery slope of not even trying to stay committed. The walleye fingers fried in doughy batter and dipped in buffalo sauce were so good. I definitely wanted to eat more (and I did, at the dinner on Jan. 2), but I held back, having tasted enough to help Tor make a decision about the menu, and snacked on a super spicy baked goat cheese and red pepper sauce for the rest of our “meeting”. My internal battle with my dietary status these days can make menu planning and eating out stressful. Should I make meat for Steve? Can I pick the sausage off that pizza? Will the waitress hate me for making special requests? Why wouldn’t I want prosciutto with that appetizer??? All these questions constantly stem from conflicts between my taste buds, the definition of “normal” eating, and expanding knowledge of how food gets to my plate. I was pleasantly surprised by how easy decisions became when I committed explicitly to exclude animal flesh from my diet for a month. All I had to make was that one simple decision. Well, okay, then I still had 73 different options for what kind of meatless taco I wanted to make for dinner, but that I can handle much better. Take Christmas Eve. No need to grapple for an explanation of why I wouldn’t eat the steak my mom cooked on a special holiday; it was just “I’m not eating meat this month.” We actually teamed up in a positive effort, she on steak and roasted veggies, and me contributing a hearty mushroom risotto that wouldn’t leave me snacking on a pile of Christmas cookies to get full later. No one had to feel awkward or guilty, we just all made our own food decisions, which happened to not detract at all from enjoying time with each other. I haven’t committed 100% yet to making 2015, or a specific part thereof, meatless. I won’t be consuming meat at home, but that doesn’t mean for sure (yet) that I won’t cook it, or that we’ll discuss (yet) whether or not we feel right having animal flesh in the house going forward. I had a couple little pieces of bacon (the one persistent temptation) in some brussels sprouts when Steve and I went out for dinner the other night, and I didn’t get sick physically or with guilt, and the world didn’t end. As you can tell, this isn’t going to be a conclusive issue, and it’ll continue to be a hot topic of my posts on the blog, mainly because, the more I learn and listen and read, the more I’m led to explore my own convictions and options. One update on my search for a non-dairy creamer: the soy one (Silk brand, which is non-GMO) appears to give me minor headaches whenever I consume it. After a few days of dull, nagging headaches, which I rarely get, I tried to deduce what dietary factors were different. I had already been off the “vacation diet” from the holidays for a week or two, and the only real change in my routine was the creamer experimentation. Lo and behold, supplementing with tea and introducing the So Delicious coconut milk creamer into my coffee vanquished any headaches. Of course, my study isn’t perfect, and there could be other factors at play, but given the regularity of other aspects of my diet, I think I’m onto the cause. Anyone else have issues with soy, or have a favorite non-dairy, non-soy creamer? I like a pretty thick creamer (I don’t take sugar in my coffee typically), so conventional almond milk doesn’t cut it for me. Other things that don’t cut it for me anymore: Tostitos with fake powdery lime flavor on them. I will admit, based purely on taste, I love them, but nowadays I usually demand more of my snacks. 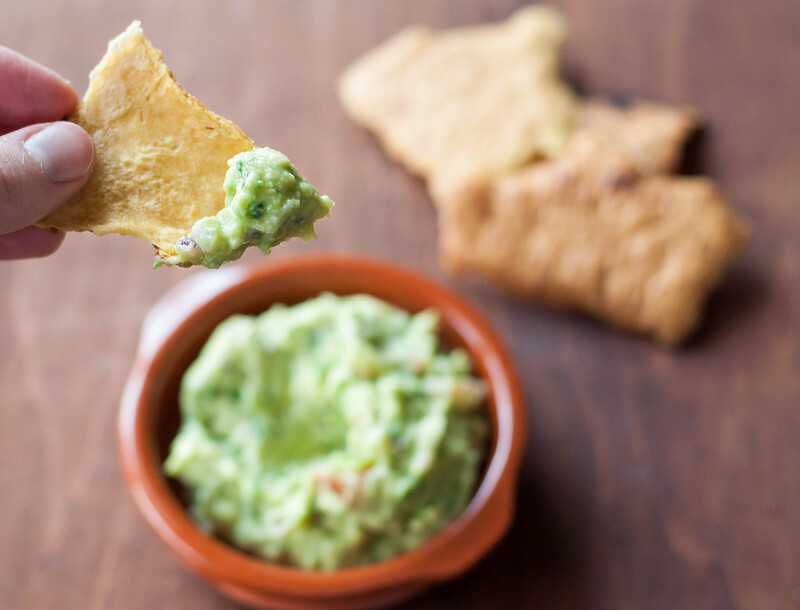 When this year’s super bowl rolls around, I’m going to be armed with mass quantities of these socca chips. Clearly I’m behind on my food blogs, or I would have gotten the memo this past summer about socca, the versatile chickpea flatbread on which you can build anything from pizza to a burrito. Or, as I did with the first batch, you can drizzle it with olive oil, sea salt, and fresh ground black pepper, and snack on it like a sophisticated French-person. I’ve had a bin of chickpea flour sitting in my fridge I think since before my last move–so maybe two years. At one point I Googled uses for it and just skimmed over “socca“, which popped up on every list, either because it sounded unfamiliar or like too much work. Then Steve and I dined at Spoon and Stable, and I thought I was going to be the pioneer of featuring socca on my food blog. Wrong. It turns out, though, not as many have done socca chips, turning the thin, tender, slightly chewy flatbread into an indisputably crispy chip. So far, the ones on my countertop have maintained their crunch going on three days. The process of making the chips isn’t difficult, but it does require some wait time and oven babysitting, so you can make them Saturday afternoon and not worry that they’ll wilt before Sunday’s football game (however, you may want to hide the stash). As David Lebovitz did in his socca recipe, upon which mine is closely based, I’ve included cumin seeds that I toasted and ground (in this) because I have too much time on my hands. To avoid the extra work and stinky kitchen, pre-ground cumin will work just fine and provide the same warm tones, if to a slightly lesser extent. 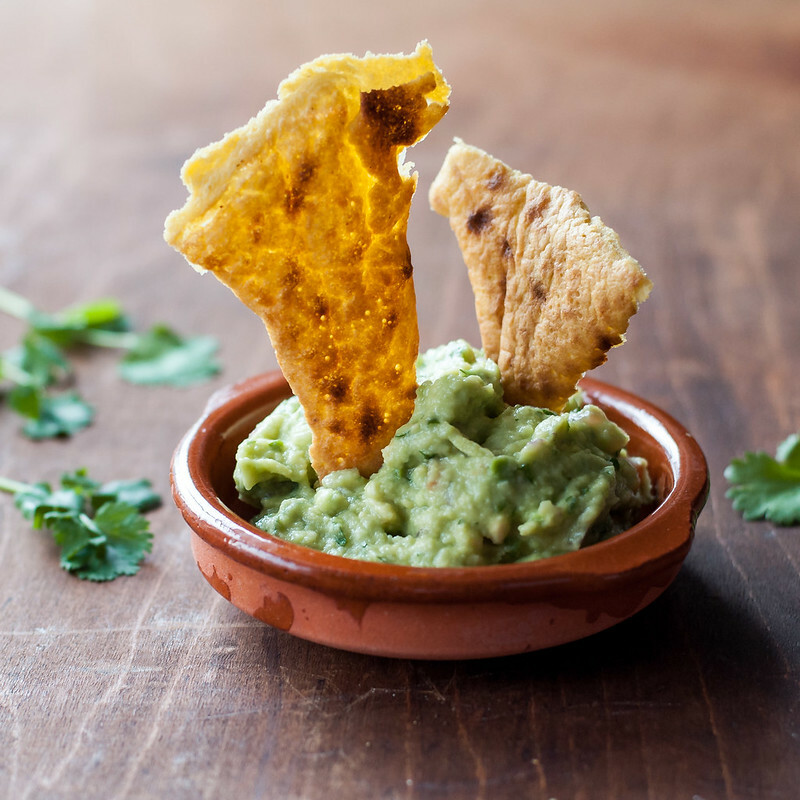 I couldn’t think of much that would go better with gluten-free, vegan, cumin-spiked chips than guacamole, which so conveniently happens to be a game day staple. Guac is one of those things that I make so often that I just do it by memory, but I do tend to always forget one ingredient when making my grocery list. Plus, on occasion, it’s helpful to have the quantities noted to streamline things, so I set out to document the recipe and share it with you. 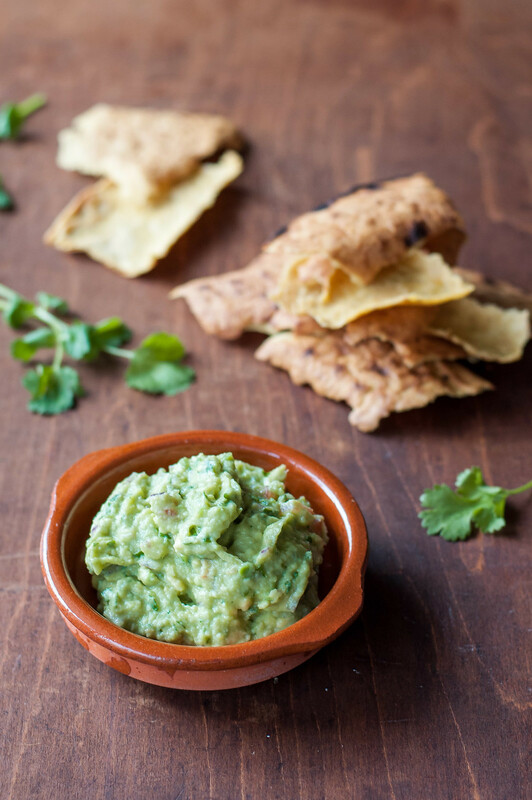 There are so many variations on basic guac, and having the classic (or my classic) version under your belt will give you grounds to start throwing in additions or substitutions. Rick Bayless has an insanely good version with roasted scallions or spring onions, roasted tomatillos, and (optionally) bacon. Sometimes I like to stir in a pinch of cumin, which would really work here to tie the flavors of the chips to the dip. 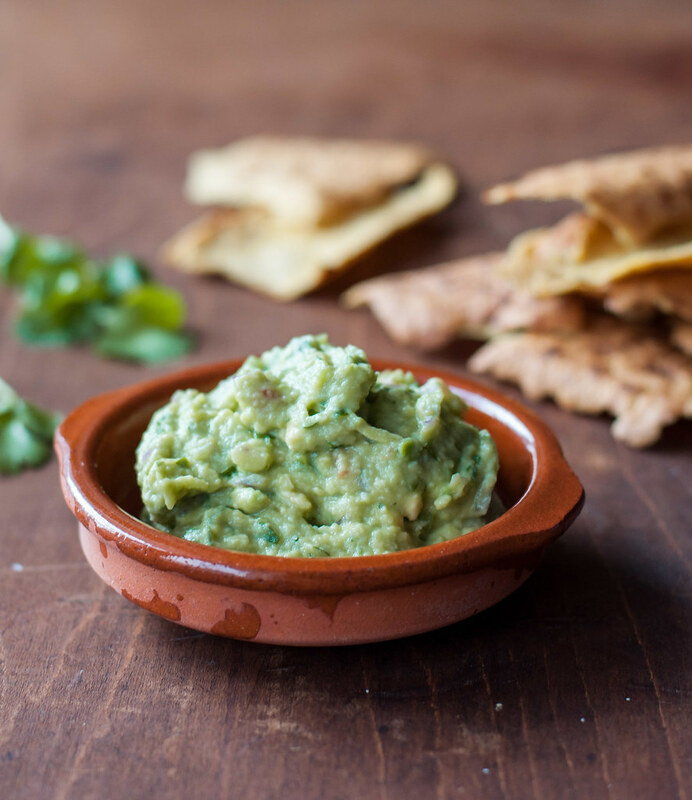 You can also simplify, paring the guacamole down to its core of avocado, lime juice, and maybe some onions, but for me, every ingredient is pretty crucial to a happy, balanced guacamole. I might just be going to nibble on some right now before I finish this post. 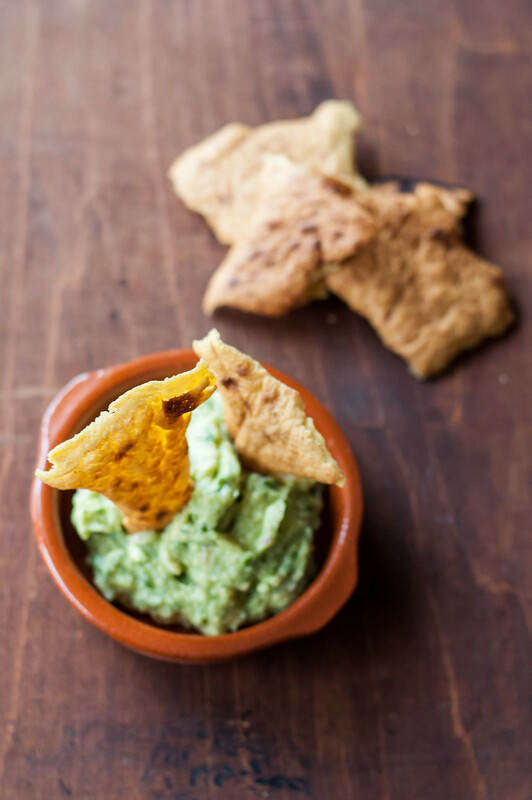 Socca chips, made from gluten-free chickpea flour, are sturdy and crunchy for even heavy duty dips. Even better, you can whip up a batch with just three simple ingredients. Whisk chickpea flour, salt, and cumin together in a medium bowl (a bowl with a lip or pour spout, if you have one). While whisking, pour in 1 cup + 2 tablespoons water, and continue whisking until batter is free of lumps. Whisk in 1½ tablespoons olive oil, then let batter stand, covered, at room temperature, for 2 hours. When the batter is ready, turn oven to broil and move rack 6 inches from broiler. If your broiler has multiple settings, use the lowest. Oil the bottom of a 12 inch cast iron skillet (see notes) with up to a tablespoon of olive oil, then place on the rack to heat for ten minutes. The oil may smoke a bit, but if it becomes excessive, remove the skillet before ten minutes has passed. If your batter bowl is without a lip or spout, transfer batter to a 2 cup liquid measuring cup. When the pan and oven have heated, use potholders to remove the skillet from the oven. Pour a third of the batter (enough to thinly coat the bottom of the skillet) into the pan, then quickly tilt the pan to spread the batter to the edges before it sets. If the edges have a very thin coating of batter, pour a little more around the outside edge of the pan, so the edges don't burn and go to waste. Place the skillet back in the oven for 4 to 5 minutes, until it has browned and blistered in a few places. You may also see a crack or large air bubble, which is fine. If your oven cooks unevenly in the front and back, rotate the pan 180 degrees after 2 minutes, being careful not to get oven mitts too close to the broiler. Cool the socca for about a minute in the pan, then use a pie spatula to loosen it from the skillet and lift or slide it onto a cooling rack. Oil the pan again, if dry, and preheat another 5 minutes. Repeat the cooking process another two times, so you end up with 3 circles of socca. Reduce oven to 200 degrees (F). 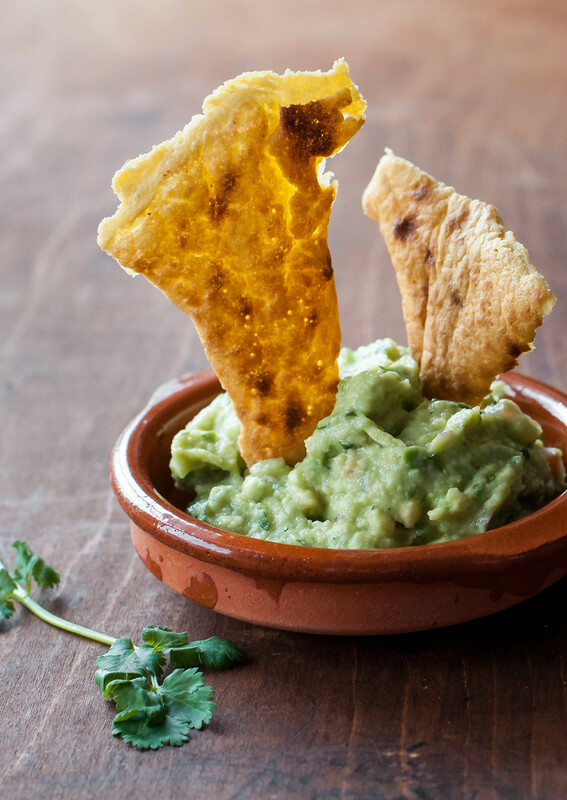 For rustic-looking chips, tear the socca into pieces about the size of tortilla chips, with some irregular shapes (you can cut the socca for a more uniform look). Place "chips" on a wire rack on a large rimmed baking sheet (I used a half sheet pan) and allow to dry and crisp in the oven for 30 minutes to an hour. My oven isn't extremely dry, so my chips take an hour. Also, if your batches of socca are very different in thickness, some chips may finish earlier than others--just remove them when they're crisp. Cool chips completely, then store in an air tight container at room temperature for a few days. Halve, pit, quarter, and peel the avocados, and place in a medium mixing bowl or other container. Using a fork, toss avocados with the juice of half a lime to coat. Prepare and add to bowl: onion, garlic, tomato, jalapeno, salt, and remaining lime juice. Use a potato masher or fork to combine all ingredients, stopping when the avocados are completely creamy and free of large chunks (alternatively, mash less if you prefer a few large chunks of avocado throughout your guac). Stir in cilantro and taste guacamole, adding more salt if needed. Store guacamole up to a few days in the refrigerator. To keep from browning, firmly press a sheet of plastic wrap over the surface of the guacamole before sealing the container. Stir before serving. 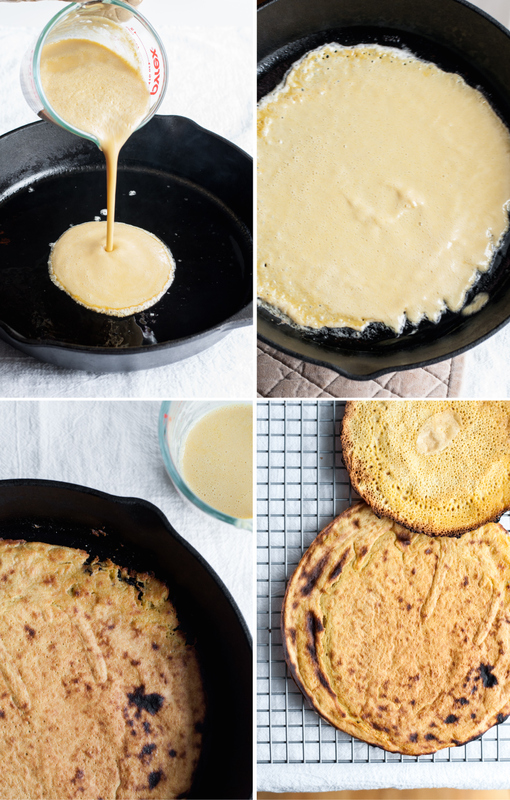 I haven't tested this, but I've read that the socca batter can stand at room temperature for up to 12 hours before using, if you prefer to leave it overnight or all day. 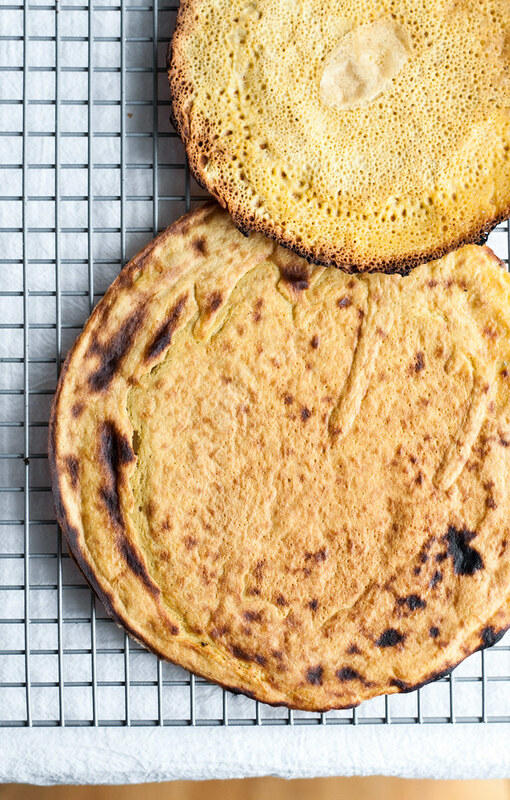 You may use a smaller pan for the socca, but anything less than 10 inches will require more than 3 rounds of broiling the bread. You can also use a nonstick pan, but make sure to locate the manufacturer's instructions first--many nonstick pans may not be oven safe, especially at very high temperatures. Cast iron is inexpensive and will last a lifetime. For the guacamole, it doesn't hurt to have an extra lime on hand. Depending on the amount of juice in the limes and the size of the avocados, you may want to add an extra squeeze of lime juice during the final seasoning.